For the first time in years, every storefront in Green Ridge corners is filled and the Green Ridge Business Association is coming together to get the community involved in the neighborhood. While the organization was established in 1975, the Green Ridge Business Association hasn’t had much community awareness until recently. The team at BlackOut Design is proud to partner with the organization and was excited to help the group kick off its inaugural Fall Festival held this past October 1st. 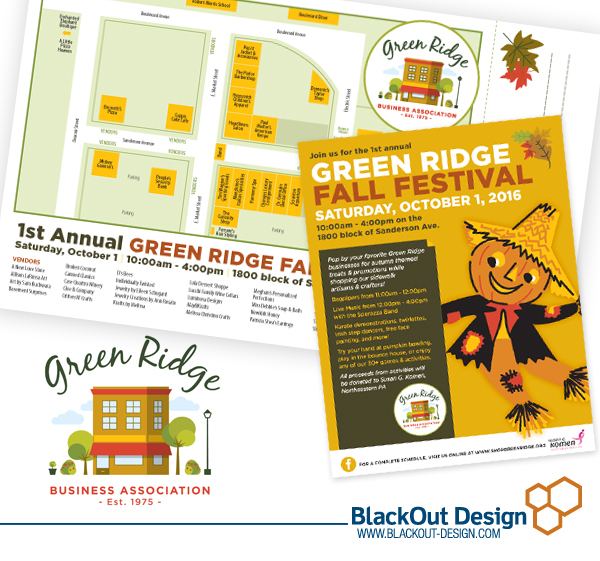 In addition to creating a logo and brand identity for GRBA, we also created a flyer and social media collateral to promote the event as well as an easy-to-read map, highlighting all the great vendors and activities at the festival. Keep an eye out for their new website in the works and stay up-to-date on their upcoming events by following the Green Ridge Business Association’s Facebook page here!